We talk a lot, maybe too much about the #whiskyfabric (don’t forget the hashtag), that internet sensational connection between people from all walks of life bound loosely or tightly by a love of our favorite spirit. The term takes a beating sometimes in the ether of social media for being trite or cutesy or not serious. And arguably in social media where life is boiled down to 140 characters, endless dissertations, malicious rants, and pithy one-liners, there may be a fair amount of truth to what the whiskyfabric is or isn’t. On a very hot, parching summer night a few days ago in the mid-cities area of Los Angeles, I saw what the whiskyfabric is, at least to me. Through a few odd coincidences and a fair amount of planning, Rob Gard (@WhiskyGuyRob) and I hosted a tasting of Irish whiskey for the Chartered Financial Analysts Society, CFALA (Los Angeles chapter, thank you). Terms like derivatives, futures, and junk bonds were spoken so often, I felt like we had morphed onto the Squawk Box set at CNBC. Cramer!! But no, we were comfortably nestled into a historic LA drink spot, Tom Bergin’s Tavern – an Irish pub from a seemingly different era. Bergin’s is like many neighborhood bars where everyone knows your name. In fact, if you believe the lore, the horseshoe-shaped bar and colorful regulars were the inspiration for the long-running teewee series, Cheers. Maybe that can’t be substantiated here but any good tavern is built on a little myth and lot of conversation. It is no myth that some of Hollywood’s greatest called Tom Bergin’s their watering hole. Today, in the midst of a renaissance of sorts, it’s a great gathering place with personable bartenders and staff, a fine spirits list, and a really large antler rack from something prehistoric called an Irish deer. Forty financial analysts walk into a bar. Sure sounds like the beginning of a joke but in reality it was the start of an amazing five-course tasting menu paired with Irish whiskey for a group that was more than excited to learn a bit, and drink a tad more. Owner Derek Schreck and general manager Jordan Delp pulled out all of the stops to make this night a wonderful bit of must-see-whiskey. And with Rob Gard on board, these folks were going to learn more than they bargained for. Rob usually works solo but took me on as an unknown Wookie who learned more than a bit from the Jedi Master of Whisky. This group really wanted to learn, eat, taste, and have fun, and not necessarily in that order, not the least of whom was one of the organizers, Shawn Tsai (the “s” is silent, shhhh). Shawn is a ball of fire who probably dreams in P&L’s and spreadsheets. She’s a bit of a Bergin’s regular herself and self-described foodie, and all through the planning process she expressed a desire to explore whisky more, and if all goes well, may become a peat freak before long. In the midst of the evening that started late due to traffic from the Executive Branch, the CFA’s were treated to Rob reading selections from his book, “Distilling Rob – Manly Lies and Whisky Truths”, which imparts his literary view of the whisky making and man making processes, while giving a first hand account of working in the Islay Scotch distillery, Bruichladdich. The treating continued with a range of whiskey from the three major Irish distilleries, including Tullamore Dew 10, the peated Connemara Single Malt, Redbreast 12, Bushmills 10, and Jameson Black Barrel, paired with oysters, scallops, smoked salmon, pork tenderloin, and vanilla bread pudding, respectively. Jordan gave us historical highlights to Tom Bergin’s and explained each dish before we partook. I left the pairing notes to Rob and happily helped answer the array of fine questions from the brainy finance folks. The questions ran the gamut from “is older better” to “what do you think of whiskey rocks” to “what’s your favorite” (the impossible Sophie’s Choice of drams). We took turns informing and answering. All the while I kept thinking how thoroughly engrossed the group was in the subject matter, and how much fun they were having. Sure, these are smart people who could explain Libor rates and why Jamie Dimon chooses the socks he wears but why so fascinated in whiskey? Of course there’s a “hot” element to whiskey these days. That’s easily part of it. Some saw investment opportunities. Some were women (gasp!) proving what we already know and illuminated by many others like Rob, whiskey is very feminine, and women coming into the whisky world is only natural. And it’s alcohol! Woohoo! The great binder on a hot afternoon after a long day in the office observing foreign currencies, stock tickers, and the price of tea in China. Among this group were Trader Joe’s booze shoppers and Mission Liquor’s ones too. Long time Scotchheads and wine lovers as well. A cast of thousands in 40 chairs in this old Hollywood tavern. But there was one gentleman who was the most curious. He sat at a center table, right up front a few feet from Rob and I with those Irish deer antlers looking down on us from over the fireplace. Occasionally we approached a few people and asked what flavors they were getting, or what they liked about a certain whiskey. This man was the most interesting of sorts when he said, in essence, that he never had whiskey before and doesn’t drink alcohol. Well, if that didn’t beat all, hands down! We think of newbies usually as ones who’ve “graduated” from some lesser plane to a more “mature” next step, whatever the category is: cars, food, spirits, pet food. But this gentleman went full throttle from most likely water, ice tea or diet soda TO Irish whiskey. Get your pencils, I feel a theory coming on. Might be a song. No, it’s definitely a theory: Whisky promotes community. It just does. Ok, it’s not a complicated theory; put your pencil down. Ever pour a dram with some non-whisky drinking friends over? It’s like a bug to a light. The glass, the bottle, the spirit in each is magnetic. Even the word whiskey is mesmerizing. There’s that whole “e” thing. It draws people together into a new Venn diagram intersection; a new community really. This gentleman, already part of a community of like financial professionals which more than likely knew their way around an alcoholic beverage, decided to hop on the stagecoach to see what all the fuss was about. He was stepping out of his norm and into something he’d never done before, right into the middle of our Tom Bergin’s Irish whiskey Venn union. Of course, it’s arguable that it had nothing to do with whiskey per se, that this gent wanted just to be out on the town a bit and wanted to try something different like that new Thai place that opened or that fusion sushi-Mediterranean-taco-waffle truck that everyone is talking about. Is whiskey just the flavor of the month? It wouldn’t seem so since it’s been a community builder for eons. But it does seem to have a curious way of bringing people together for conversation, laughter, food and learning. 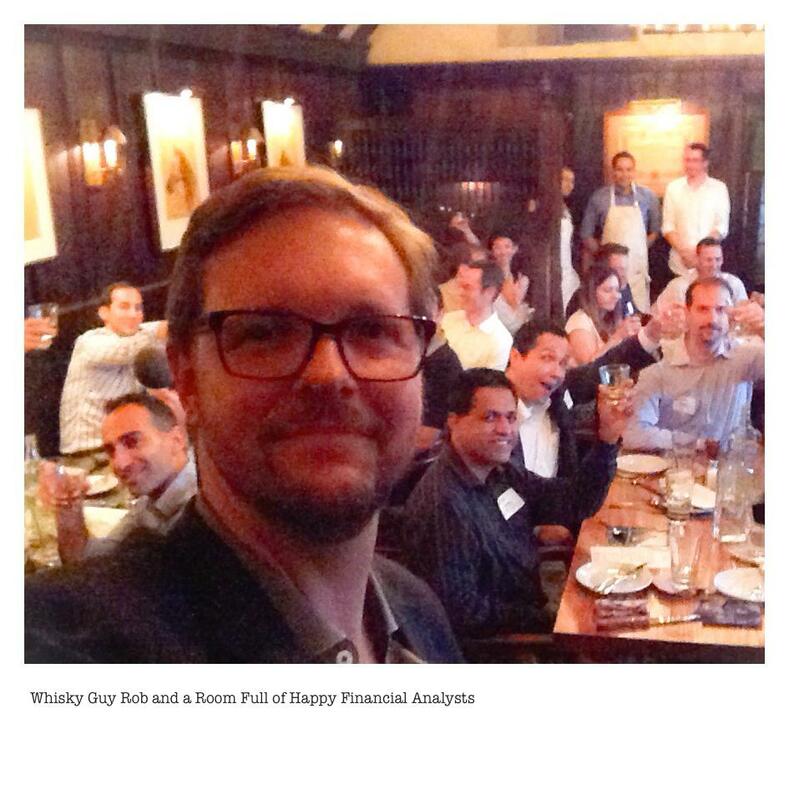 And in this one financial analyst’s case, into a community of folks both new and old to the whiskey world. Did he like all the whiskey and food? The jury may still be out on that but it really doesn’t matter. 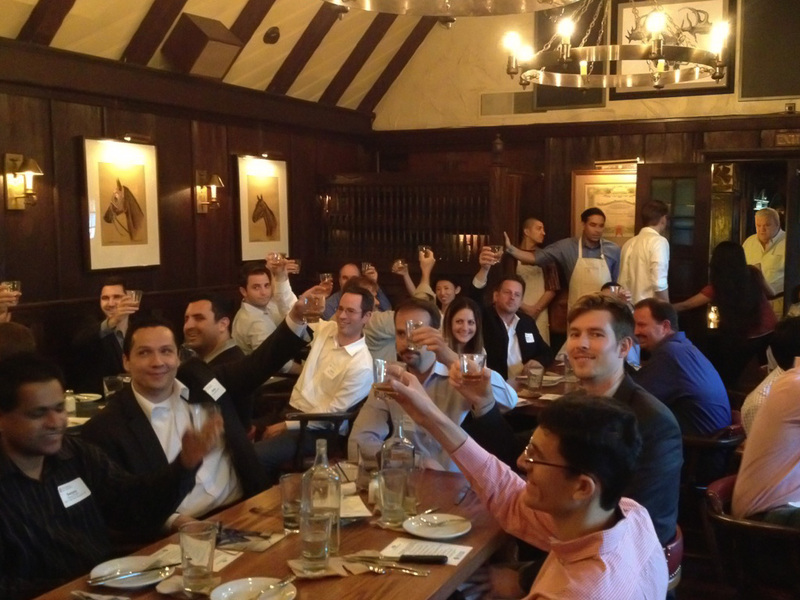 Forty financial analysts walk into a bar and one tried whiskey for the first time with a host of new and old friends. That’s a pretty good evening and what the #whiskyfabric is all about. Many thanks to the fine folks at Tom Bergin’s Old Horseshoe Tavern & Thoroughbred Club; Derek Schreck; Jordan Del;, the mystery chef;, co-chairs Shawn Tsai, CFA & Michael Triedl, CFA; the CFALA; Rob Gard; and the letter “C” for making this wonderful evening of fun community building through whiskey and food possible. This sounds like a fantastic night KROUSE! If only it were a wee bit closer. Would have loved to be in the audience. Keep up the great work! A great night indeed. You should swing by Tom Bergin’s. You might (probably) run into Rob or Shawn. By the way, the corned beef poutine(!) is darn yummy. Thanks!